The well-written dialogue grounded the film with a sense of reality as it veered into the supernatural allowing for a horror scenario within a psychological thriller. Having seen his last film “The Lobster”, I was either drawn in by the abstract or lead on by the suspense. Either way, I was intrigued. The audience seemed to love it whether they questioned the grey areas or not. The performances stood out for the film and kept us drawn in. Barry Keoghan was riveting as our antagonist, sending goosebumps down your spine while doing the most ordinary tasks such as eating spaghetti. Nicole Kidman was nothing short of excellent as usual. Collin Farrell plays parenthood well starting off as a surgeon with great principles until his past becomes the main problem towards the traumatic events that occur throughout the film. Here’s a scene from the film. Lanthimos derives his storytelling from fables. 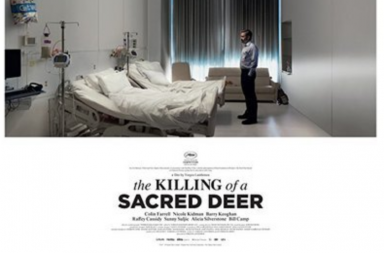 A Killing of a Scared Deer derives from an Ancient Greek storytelling of the consequences of killing a sacred deer with divine properties. The theme of the film bases itself on the price of consequences. This is considered an art house film, which is clearly a good sign to see in Hollywood with such a stellar cast. However, it was clear to see this film had some uncomfortable moments combined with a gradual cage rattling score. The score lined with its very symmetrical Stanley Kubrick style shots. It’s hard not to compare this film – at least to begin with – with Kubrick’s The Shining. Regardless if you’re familiar with Lanthimos’ work or not, you will be hooked on this strange, captivating, suspenseful ride. The small talk between the characters had great moments of humor and quirky details as well which is why this film is definitely one of the more original pieces this year. Efthymis Filippou who has help Lanthimos in most of his scripts is brilliant in connecting with a mature audience bringing you to a world where we watch these characters hit a mid-life crisis. It seems that horror is making a comeback within psychological thrillers. Cannes awarded Sofia Coppola best Director for her horror/thriller “Beguiled” and recently Darren Aronofsky’s Mother is known to be a seat chiller. If it’s the middle of the week and you’re trying to be curious in your town, this is the film to watch. Its box-office I predict will match its mature audience as well as film lovers and fans of “The Lobster”. I hoped for a more conclusive ending, however, if this is how the fable ends, the story is well told.